Circuits can often be an intimidating mess of wires and parts. In order to turn this mess into a manageable and easy to understand circuit, one must have a good understanding of a few basic electrical circuit components. This Instructable will cover the basics on breadboards, resistors, capacitors, inductors, and diodes. You will learn how and when to use each component. Using the Electronics Lab from Autodesk Circuits, we will see simple simulations showing how each component can be used in a circuit. If you are new to electrical circuits, this is the place to start! Breadboards are an electrical tool used for prototyping and testing circuits. They are incredibly useful when connecting components together for the first time and on a low budget. No soldering required! The top two rows, and bottom two rows conduct horizontally. Since they are supplying a constant DC voltage, they can be called 'voltage rails'.This means that every hole in that row is electrically connected to each other. These rows are not connected to any other row. This is demonstrated by the red and black lines in the top two rows. The black wire is connected to itself through the breadboard. So is the red wire in the second-to-top row. The middle section of the breadboard, rows A through J, conduct vertically. This means that every hole in a single column is electrically connected to each other. The columns are not connected to any other column. Another important distinction is that rows A-E are not connected to F-J. This is useful because sometimes we want to place a component that has pins on the top and bottom that are not suppose to be directly connected. A1 is connected to E1. This is a useless connection since that column conducts vertically. E10 to F10 is a useful connection because it bridges rows A-E to rows F-J. E24 to F24 is then connected from J24 to J41 which is then connected to the Arduino's pin A4. The Arduino's 5V pin is connected to the 5V rail (second to bottom). This 5V rail is connected by the red wire on the right side, to the red 5V rail on the top of breadboard. Each LED pin is connected to a different pin on the Arduino. Use black wires when connecting something to GND (-), and red wires when connecting something to the positive voltage rail (+). While all color wires work the same way, it is common for red to represent positive and black for negative. Connect the power source to the 'power rails'. This is the top two and bottom two rows respectively. Make sure to connect the positive and negative wires to their corresponding row on the breadboard (denoted by the - and + symbol). Resistors are an integral part of electrical engineering as they provide a specified amount of electrical resistance. They can reduce the flow of electrons. What does this mean? This means that resistors can limit current and drop/reduce voltage. First off, resistance is measured in ohms. 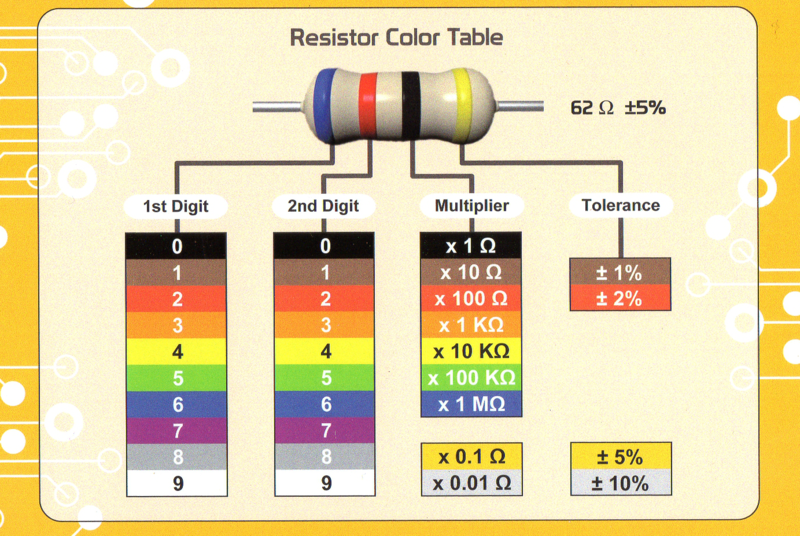 To read the resistance of a resistor we need to look at the color bands on the device. Use this resource to learn how to use a resistor color code guide to determine the value of a resistor. You could also use an online resistance calculator to quickly find the value. Take a moment to try and determine the resistance of the resistor in the first picture............................200K ohms = 200,000 ohms. Now lets move on to current limiting and voltage division/reduction. The relationship between voltage, current, and resistance is dictated by ohm's law: voltage = current * resistance. The simulation below shows some examples of how ohm's law can explain a resistor's ability to limit current and drop voltage. The left most circuit limits current flow in the circuit. The voltage across the resistor is 9V and the resistor has a value of 330 ohms. Using ohm's law: 9 = Current * 330 -> Current = 0.027 amps. If we were to reduce the resistor to 100 ohms then we would get 9 = Current * 100 -> Current = 0.09 amps. The higher the resistance, the less current. The middle circuit is called a voltage divider. Based on the resistor values, the node in-between the two resistors (the output) will have a voltage less than the 'input' voltage. The last picture in this step shows a voltage divider. The output voltage can be modeled by this equation: (output voltage) = (input voltage) * (R2/(R2+R1)). It is important to note that a voltage divider does not regulate voltage. When you draw a lot of current from the output node, this equation does not hold. If you are drawing less than 1 mA then you can use this equation to determine the voltage between the two resistors. The right most circuit is a potentiometer. This potentiometer is a variable voltage divider. By adjusting the dial you are changing the resistance of the voltage divider. The middle pin is the equivalent to the output from the middle circuit. Resistors can be put in series (one after another) for the resistances to add, or in parallel (right next to each other, top leads connected, bottom leads connected) to reduce the resistance. 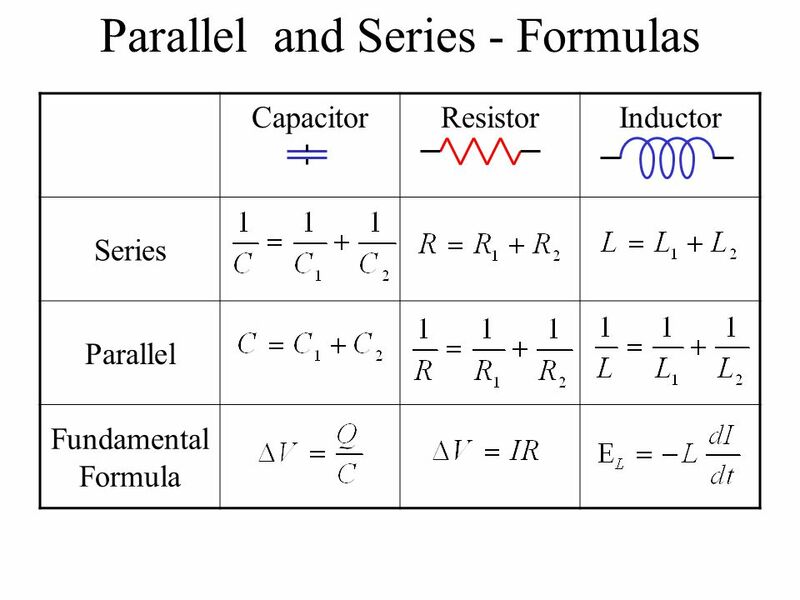 Use this guide to calculate the resistance when in series and in parallel. Capacitors are another very useful component used in circuits. While they can be complicated and used for many different purposes we will focus on the main uses and applications. Start by referring to the second picture. A capacitor can be thought of as two pieces of conductive material that are very close together but not touching. The two 'plates' are separated by a dielectric material. Dielectric means it doesn't conduct. Since there is no conductive path between the two plates, direct current (DC) cannot flow through the device. Instead, charge builds up on one side of the plate which causes the opposite charge to build up on the other side. This might look familiar because a battery also have one end that is positive and another end that is negative. A capacitor can hold charge; It can hold a small amount of power and energy. Its capacitance is measured in Farads. To get a capacitor to have charge, you need to charge it up. This is done by providing DC power. With time it will charge. It will reach a point where it cannot hold any more charge. If you were to short the positive and negative lead, you would see the voltage decrease quickly. This is discharging a capacitor. The last photo shows the voltage across a capacitor when you charge and discharge it continuously. Capacitors come is various sizes and types. The two main types are ceramic and electrolytic. Ceramic capacitors are small in size and do not hold much charge. They are not polarized though. This means that the direction of the device does not matter. Electrolytic capacitors on the other hand are polarized. You have to be careful to put the negative lead into the GND rail. Electrolytic capacitors tend to have a higher capacity and can accept higher voltages. Be careful to choose a capacitor that can handle the voltage you plan on using. Reading the capacitance value of an electrolytic capacitor is easy because it is generally written on the device (along with the voltage value). Reading the capacitance value of ceramic 'cap' is more difficult. There are generally three numbers on the device. The first two are the value without the magnitude. The third is the order of magnitude off from a pico-farad or 10^(-12) farads. Its the multiple of 10 off from a pico-farad. So if the third number was 6, that means the magnitude would be 10^(-6). So the number 476 is 47 nano-farads or 47*10^(-6). Note: pico = 10^(-12), nano = 10^(-9), micro = 10^(-6), milli = 10^(-3). 1 farad is a huge capacitance. Nano-farads, or 10^(-9) farad capacitors are fairly common. 22 micro-farad or 10^(-6) capacitors are often used for decoupling. Decoupling: This means it is can help smooth a voltage rail (a rail is another way of saying, a voltage line). Place a capacitor between the positive rail and negative rail, and the capacitor will counter-act, or smooth, any spikes (negative or positive). This is an incredibly useful tool. It is always a good idea to place 'decoupling capacitors' on your voltage rails. Filtering: This is similar to the idea of decoupling but more geared towards changing a signal rather than a voltage rail. Say you have a changing electrical signal. Combine a capacitor, resistor, and/or inductor (we will get there) and you can smooth a signal that is changing. Depending on the configuration you can filter out high frequency signals (changing a lot), aka only let through the low frequency signal (changes slowly), or visa versa. As mentioned above, capacitors can be used to hold charge. That being said, they can only hold charge for a very short amount of time. This is probably not a great replacement for a battery yet. Technological progress may someday provide us with capacitors that will replace batteries. Use these equations to calculate the capacitance when capacitors are put in series and in parallel. Press the button in the simulation below to experiment with charging and discharging a capacitor. Hold the button down for around a second before releasing. While the button is pressed, the capacitor is being charged. When the button is not being pressed, the capacitor is being discharged. Diodes are a really simple but versatile circuit device. They only allow current to flow in one direction. A diode comes as a small black package with leads coming from both ends. One end of the black package will have a grey line running around it. The current will only be allowed to flow towards this grey line. Diodes also have a voltage drop, normally around 0.7 volts. This means that if you put a diode in your circuit, the end towards the grey line will have 0.7 volts less than what you started with. This is something to keep in mind. The last photo shows what a diode does to a sinusoidal wave, a signal that goes positive and negative continuously. The oscilloscope shows that the diode only allows the positive current to pass and the negative portion gets cut out. Inductors, another important electrical component, resists changes in current. So while capacitors like to smooth out voltage, inductors like to resist changes in current. They are essentially a coil of wire. When current is passed through this coil of wire, a magnetic field is created. This magnetic field holds energy and when the current getting passed through the wire changes, the magnetic field induces current to try and counteract this change. What does it mean in simple terms? If there is a positive spike/change in current, the inductor will induce a negative voltage to try and counteract this current change. Why a negative voltage and not a negative current? The negative voltage will in turn cause a negative current that will attempt to counteract the spike in positive current. If there is negative spike in current, the inductor will create a positive spike. Inductance is measured in henries. The last photo shows what happens to an inductor when its fed a square wave (see the first oscilloscope to see what a square wave is). The second oscilloscope shows the voltage across the inductor. The negative spikes correspond to when the square wave goes from 0V to 5V. The positive spikes correspond to when the square wave goes from 5V to 0V. This is the inductors attempts to counteract the changes of the square wave. Inductors in series sum. So if you put two 10 micro henry inductors in series, their equivalent inductance is 20 micro henries. Use this guide to calculate the inductance when in parallel and when in series. Breadboards, resistors, capacitors, diodes, and inductors all have a specific purpose. With these components you have an unlimited number of circuits you can create. Some examples include, LED light display, an electronic signal filter, a boost circuit, and much more. A good understanding of these basic components is also very important in debugging circuits, in figuring out what is wrong. For example, if your circuit has a lot of ripple (the voltage signal is changing rapidly in an unwanted way), you might want to consider adding a decoupling capacitor. If your LED's keep blowing up, you might want to add a resistor to limit the current. When choosing components make sure to check that the device can handle the current and voltage you plan on using. A components breaking point is generally specified by the supplier. I thought that auto desk circuits was for beginners. I didn't see anything in it that I understood. I need some beginners help! Instructable also sheds light on the AutoDesk Circuits program. Thanks! Circuits simulations are definitely helpful for preventing issues, and troubleshooting problems when they arise. Thank you for catching that! It has been corrected. Hi, I`m a sixty year old Grandma from country Oz, and I just bought a Raspberry Pi and a circuit kit to learn all this stuff -- but I had a LOT of questions. This helped clear up many of them! Thanks for all the hard work. Thanks for the comment, its good to hear that the Instructable helped! There are tons of fun projects to make with the Pi. Thank you for the information and the time you spent uploading. Solved a few circuit breadboard confusion issues plus OHM's law included, a bonus. Glad I could help! I am always impressed by how much of electrical engineering can be boiled down to ohms law. A wire and a battery. Hook the wire to both the positive terminal and the negative terminal. You have a circuit and electron flow... Caution Sparks may fly if the battery is large. The wire may also get HOT and burn in half. Never the less thats all you need for a simple circuit. A power source and something to allow current to flow. This is a good point, definitely a circuit (specifically a short circuit). Not safe to do to a battery though. If you short circuit a battery for too long it could explode. Definately not the safest technique to short a battery this way without due regards to childrens' (people's) safety! It can definitely be tricky to get components. Digikey, SparkFun, Adafruit, and Amazon are good places to start looking. Thanks for the shout-out! I had fun making the guide and am glad to hear that it is useful! Thank you! Autodesk circuit's electronics lab is great. It has saved me a lot of time and effort as well as keeping me from blowing up a lot of components haha.